Authors Note: I wrote this mini journal article for my MCB 140L class. The class focused on the role and structure of septins, a group of proteins that are associated with several biological pathways, like autophagy. 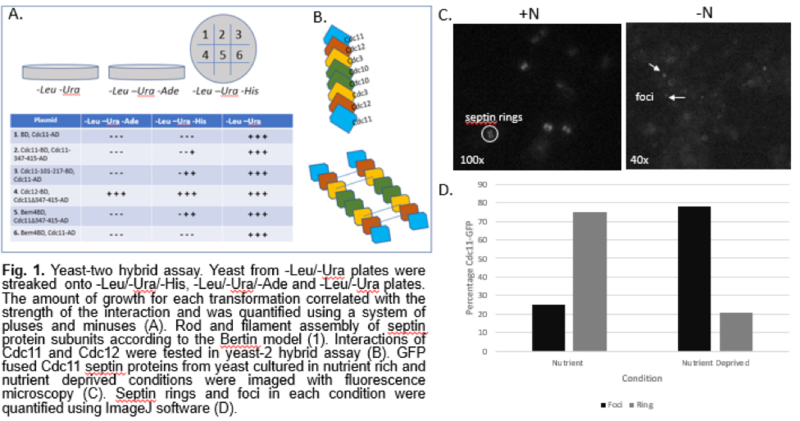 I chose to write about a set of experiments we did using yeast-two hybrid assays and fluorescence microscopy to understand the organization and interactions of septins. Abstract: Autophagy is a degradation pathway in which autophagosomes, vesicular structures, deliver proteins and damaged organelles to the lysosomes for degradation. Septins are GTP-binding proteins that localize at the bud-neck and are involved in cytokinesis in budding yeast. Septins also localize at pre-autophagosomal structures and the autophagosome in the autophagy pathway. Previous data suggests that septins are involved in some pathways of autophagy, such as starvation-induced autophagy. It has been proposed that septins organize into distinct filaments and arrange into higher order structures at cell membranes, such as septin rings and foci. It is important to understand the structural and relational organization of septins, especially to determine their role in the autophagy pathway. Our results suggest that the structure and localization of septins changes after autophagy induction. We used a yeast-two hybrid assay to confirm the unique organization of septin subunits into rods and filaments. Fluorescence microscopy allowed us to visualize and observe the change in the localization and structure of those filaments from rings at the bud-neck to foci at the periphery following autophagy. This suggests septin filaments are dynamic. Introduction: Septins, GTP-binding proteins, were first discovered in screens for cell cycle division mutants in budding yeast and are conserved from fungi to humans. Septins form hetero-oligomeric complexes that are assembled into a variety of higher-order structures, such as filaments and rings. These structures associate with cytoskeletal networks, like actin, or localize at plasma membranes to establish cell polarity and act as a cellular scaffold during cellular cycles such as cytokinesis, mitosis, apoptosis, and exocytosis. In yeast, four septin subunits form a Cdc11-Cdc12-Cdc3-Cdc10-Cdc10-Cdc3-Cdc12-Cdc11 octomeric rod that polymerize into filaments at distinct domains (1). Septins do not have any specific organization early in the cell cycle but arrange at the mother bud-neck of yeast into higher-order ring structures as the bud emerges. The septin rings remain at the site of division after cytokinesis and can thus be observed in the mother and daughter cells (2). Septins evidently play a role in the composition and distribution of membrane domains. Previous studies have suggested that septins regulate cytokinesis and bud site selection by recruiting proteins and bud-neck markers (3). The dynamics and higher-order structures of septins can be further observed in their role in autophagy. Autophagy is a degradation pathway in which autophagosomes, double membrane vesicular structures, deliver proteins and damaged organelles to the lysosomes for degradation. The autophagy pathway can be induced via nutrient deprivation. 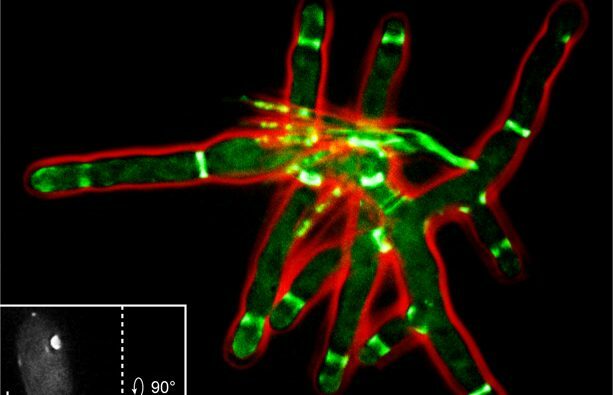 Barve et al observed that septins disassemble after nutrient deprivation and move to the cell periphery, forming unique dotted structures, or foci (4). By creating a Cdc11-GFP fusion and performing a simple yeast-two hybrid assay, we have constructed the arrangement of certain septin subunits and visualized the change in septin structures following autophagy. Materials and Methods: A yeast-two hybrid assay was designed using the methodology described in Camacho et al (5). Yeast cells grown to log phase were transformed with activation domain and binding domain vectors. The transformed cells were then plated in -Leu/-Ura media to grow only cells that received both plasmids. To determine whether the bait and prey interacted, the yeasts were streaked from the -Leu/-Ura plates onto -Leu/-Ura/-His and -Leu/-Ura/-Ade plates. The amount of growth for each transformation correlated with the strength of the interaction and was quantified using a system of pluses and minuses. GFP tagged Cdc11 yeast cells were cultured in rich medium and in medium lacking nitrogen following the methodology of Barve et al to understand septin protein localization during starvation (4). A fluorescence microscope was used in combination with a digital CCD camera to record images at 40x and 100x for analysis. ImageJ software was used to quantify the number of septin rings and foci under the two conditions. Our yeast-two hybrid assay allowed us to determine interactions between select subunits in septins. We tested interactions between the septin subunits Cdc11 and Cdc12, and Cdc11 and itself. The interaction between Cdc11 and Bem4, a bud emergence protein, with and without the coiled coil domains, was also tested (Fig. 1A). The yeast-two hybrid assay showed a strong interaction between the septin subunits Cdc11 and Cdc12. This supports the rod model proposed by Bertin et al (Fig. 1B). It also shows an interaction between Cdc11 and itself, which is an expected interaction in septin filaments. We also observed some interactions that deviated from previous studies on septin organization. The deletion of the coiled-coil region of Cdc11 resulted in stronger interactions overall (Fig. 1A), which was unexpected. The slight interaction between Bem4, a protein involved in bud emergence, and Cdc11 lacking the coiled-coil domain is also an interaction that differs from models proposed in previous studies. To understand how septins localize after induction of autophagy, we observed Cdc11-GFP cells under a fluorescence microscope. Under nutrient rich growth conditions, we noted a prominent amount of distinct septin ring structures. In yeast that were grown under nutrient poor conditions, we observed dotted foci structures (Fig. 1C). Quantitation confirmed that starvation of cells yields a higher percentage of foci than septin ring structures (Fig. 1D). While it was difficult to tell whether the septin rings were forming at the bud neck as expected, the quantification and images of the yeast cells shows that there is a movement of septins to the cell periphery after starvation. The shift from septin ring structures to punctate foci structures is a clear indication that there is some rearrangement of septin units in addition to re-localization, proving that septin interactions are somehow regulated by autophagy. Discussion: Although septins have been shown to be involved in important cell functions such as cytokinesis and autophagy, there are a limited number of studies that ascertain their protein-protein interactions and higher order organization. The model proposed by Bertin et al. establishes several interactions between the four septin subunits, but we constructed a partial model of septin rods and filaments by focusing on the Cdc11 and Cdc12 subunits as well as the Bem4 bud emergence protein in a yeast-two hybrid assay (Fig. 1A). This allowed us to establish that septins arrange into organized and dynamic structures. While the strong interaction between the septin subunits Cdc11 and Cdc12 were expected, we also observed some unexpected interactions. The deletion of the coiled-coil region of Cdc11 resulted in stronger interactions overall (Fig. 1A). This is surprising, considering that a previous study concluded that the coiled-coil domain is required for the proper function of Cdc (6). There was a slight interaction between Bem4, a protein involved in bud emergence, and Cdc11 lacking the coiled-coil domain. This is unexpected since a previous study demonstrated that the coiled-coil domain is required for the proper function of Cdc11 (6). While it has been reported that Cdc11 interacts with Bem4, it was determined that the coiled-coil domain plays no role in the interaction. The literature shows that the coiled-coil region is important for the interaction with the Cdc3 subunit and Bem4 (6). Our results suggest that the coiled-coil domain may inhibit Bem4 and Cdc11 interaction. Overall, our yeast-two hybrid assay indicated interactions that differ from the model proposed by Bertin et al. By observing GTP fused Cdc11 protein, we imaged the localization of septins in nutrient rich and autophagy induced conditions. Our results show a significant increase in the number of foci compared to septin rings in autophagy induced conditions, suggesting that autophagy influences the localization of septins (Fig. 1D). The shift from septin rings to foci shows that septins are composed of dynamic protein units that can adjust structurally in reaction to autophagy. While our report does not establish a specific role for septins in autophagy, the localization of septins from the bud neck to the cell periphery after autophagy indicates that septins must play some role in the pathway. Future experiments can investigate other subunit interactions, such as Cdc12 with Cdc3 interactions, to further ascertain the octomeric and filamentous structure of septins. While there is a definite re-localization of septins after induction of autophagy, a Fluorescence Loss In Photobleaching (FLIP) experiment can further demonstrate septin dynamics by observing whether septins at the bud-neck migrate to the cell periphery after induction of autophagy. Observing the effect of septin mutations on autophagy, such as the assembly of pre-autophagosomal structures, would further establish how the localization of septins is related to their function in autophagy. Bertin, Aurélie, et al. "Phosphatidylinositol-4, 5-bisphosphate promotes budding yeast septin filament assembly and organization." Journal of molecular biology 404.4 (2010): 711-731. Longtine, Mark S., and Erfei Bi. "Regulation of septin organization and function in yeast." Trends in cell biology 13.8 (2003): 403-409. Gladfelter, Amy S., et al. "Interplay between septin organization, cell cycle and cell shape in yeast." J Cell Sci118.8 (2005): 1617-1628. Barve, Gaurav, et al. "Septins are involved at the early stages of macroautophagy." bioRxiv (2016): 043133. Camacho, Luísa, et al. "Arabidopsis Rab-E GTPases exhibit a novel interaction with a plasma-membrane phosphatidylinositol-4-phosphate 5-kinase." Journal of cell science 122.23 (2009): 4383-4392. Casamayor, Antonio, and Michael Snyder. "Molecular dissection of a yeast septin: distinct domains are required for septin interaction, localization, and function." Molecular and cellular biology 23.8 (2003): 2762-2777.